For other uses, see Carpathian (disambiguation). The Carpathian Mountains or Carpathians (/kɑːrˈpeɪθiənz/) are a mountain range system forming an arc roughly 1,500 km (932 mi) long across Central and Eastern Europe, making them the third-longest mountain range in Europe after the Ural Mountains with 2,500 km (1,553 mi) and Scandinavian Mountains with 1,700 km (1,056 mi). They provide the habitat for the largest European populations of brown bears, wolves, chamois, and lynxes, with the highest concentration in Romania, as well as over one third of all European plant species. The Carpathians and their foothills also have many thermal and mineral waters, with Romania having one-third of the European total. Romania is likewise home to the second-largest surface of virgin forests in Europe after Russia, totaling 250,000 hectares (65%), most of them in the Carpathians, with the Southern Carpathians constituting Europe's largest unfragmented forested area. The Carpathians consist of a chain of mountain ranges that stretch in an arc from the Czech Republic (3%) in the northwest through Slovakia (17%), Poland (10%), Hungary (4%) and Ukraine (10%) Serbia (5%) and Romania (50%) in the southeast. The highest range within the Carpathians is the Tatras, on the border of Slovakia and Poland, where the highest peaks exceed 2,600 m (8,530 ft). The second-highest range is the Southern Carpathians in Romania, where the highest peaks exceed 2,500 m (8,202 ft). The term Outer Carpathians is frequently used to describe the northern rim of the Western and Eastern Carpathians. The most important cities in or near the Carpathians are: Bratislava and Košice in Slovakia, Kraków in Poland, Cluj-Napoca, Sibiu, and Braşov in Romania, and Uzhhorod in Ukraine. The name "Carpates" is highly associated with the old Dacian tribes called "Carpes" or "Carpi" who lived in a large area from the east, north-east of the Black Sea to Transylvanian plains on the present day Romania and Moldova. The name Carpates may ultimately be from the Proto Indo-European root *sker-/*ker-, from which comes the Albanian word karpë (rock), and the Slavic word skála (rock, cliff), perhaps via a Dacian cognate[which?] which meant mountain, rock, or rugged (cf. Germanic root *skerp-, Old Norse harfr "harrow", Gothic skarpo, Middle Low German scharf "potsherd", and Modern High German Scherbe "shard", Old English scearp and English sharp, Lithuanian kar~pas "cut, hack, notch", Latvian cìrpt "to shear, clip"). The archaic Polish word karpa meant "rugged irregularities, underwater obstacles/rocks, rugged roots, or trunks". The more common word skarpa means a sharp cliff or other vertical terrain. The name may instead come from Indo-European *kwerp "to turn", akin to Old English hweorfan "to turn, change" (English warp) and Greek καρπός karpós "wrist", perhaps referring to the way the mountain range bends or veers in an L-shape. In late Roman documents, the Eastern Carpathian Mountains were referred to as Montes Sarmatici (meaning Sarmatian Mountains). The Western Carpathians were called Carpates, a name that is first recorded in Ptolemy's Geographia (second century AD). In the Scandinavian Hervarar saga, which relates ancient Germanic legends about battles between Goths and Huns, the name Karpates appears in the predictable Germanic form as Harvaða fjöllum (see Grimm's law). "Inter Alpes Huniae et Oceanum est Polonia" by Gervase of Tilbury, has described in his Otia Imperialia ("Recreation for an Emperor") in 1211. Thirteenth- to fifteenth-century Hungarian documents named the mountains Thorchal, Tarczal, or less frequently Montes Nivium. The northwestern Carpathians begin in Slovakia and southern Poland. They surround Transcarpathia and Transylvania in a large semicircle, sweeping towards the southeast, and end on the Danube near Orşova in Romania. The total length of the Carpathians is over 1,500 km (932 mi) and the mountain chain's width varies between 12 and 500 km (7 and 311 mi). The highest altitudes of the Carpathians occur where they are widest. The system attains its greatest breadth in the Transylvanian plateau and in the southern Tatra Mountains group – the highest range, in which Gerlachovský štít in Slovakia is the highest peak at 2,655 m (8,711 ft) above sea level. The Carpathians cover an area of 190,000 km2 (73,359 sq mi), and after the Alps, form the next-most extensive mountain system in Europe. Although commonly referred to as a mountain chain, the Carpathians do not actually form an uninterrupted chain of mountains. Rather, they consist of several orographically and geologically distinctive groups, presenting as great a structural variety as the Alps. The Carpathians, which attain an altitude over 2,500 m (8,202 ft) in only a few places, lack the bold peaks, extensive snowfields, large glaciers, high waterfalls, and numerous large lakes that are common in the Alps. It was believed that no area of the Carpathian range was covered in snow all year round and there were no glaciers, but recent research by Polish scientists discovered one permafrost and glacial area in the Tatra Mountains. The Carpathians at their highest altitude are only as high as the middle region of the Alps, with which they share a common appearance, climate, and flora. The Carpathians are separated from the Alps by the Danube. The two ranges meet at only one point: the Leitha Mountains at Bratislava. The river also separates them from the Balkan Mountains at Orşova in Romania. The valley of the March and Oder separates the Carpathians from the Silesian and Moravian chains, which belong to the middle wing of the great Central Mountain System of Europe. Unlike the other wings of the system, the Carpathians, which form the watershed between the northern seas and the Black Sea, are surrounded on all sides by plains, namely the Pannonian plain to the southwest, the plain of the Lower Danube (Romania) to the south, and the Galician plain to the northeast. This is an (incomplete) list of the peaks of the Carpathians having summits over 2,500 metres (8,200 ft), with their heights, geologic divisions, and locations. This is a list of the highest national peaks of the Carpathians, their heights, geologic divisions, and locations. 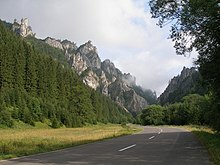 In the Romanian part of the main chain of the Carpathians, mountain passes include Prislop Pass, Tihuța Pass, Bicaz Canyon, Ghimeș Pass, Buzău Pass, Predeal Pass (crossed by the railway from Braşov to Bucharest), Turnu Roșu Pass (1,115 ft., running through the narrow gorge of the Olt River and crossed by the railway from Sibiu to Bucharest), Vulcan Pass, and the Iron Gate (both crossed by the railway from Timișoara to Craiova). The area now occupied by the Carpathians was once occupied by smaller ocean basins. The Carpathian mountains were formed during the Alpine orogeny in the Mesozoic and Tertiary by moving the ALCAPA, Tisza and Dacia plates over subducting oceanic crust. The mountains take the form of a fold and thrust belt with generally north vergence in the western segment, northeast to east vergence in the eastern portion and southeast vergence in the southern portion. The external, generally northern, portion of the orogenic belt is a Tertiary accretionary prism of a so-called Flysch belt (the Carpathian Flysch Belt) created by rocks scraped off the sea bottom and thrust over the North-European plate. The Carpathian accretionary wedge is made of several thin skinned nappes composed of Cretaceous to Paleogene turbidites. Thrusting of the Flysch nappes over the Carpathian foreland caused the formation of the Carpathian foreland basin. The boundary between the Flysch belt and internal zones of the orogenic belt in the western segment of the mountain range is marked by the Pieniny Klippen Belt, a narrow complicated zone of polyphase compressional deformation, later involved in a supposed strike-slip zone. Internal zones in western and eastern segments contain older Variscan igneous massifs reworked in Mesozoic thick and thin-skinned nappes. During the Middle Miocene this zone was affected by intensive calc-alkaline arc volcanism that developed over the subduction zone of the flysch basins. At the same time, the internal zones of the orogenic belt were affected by large extensional structure of the back-arc Pannonian Basin. The last volcanic activity occurred at Ciomadul about 30,000 years ago. Iron, gold and silver were found in great quantities in the Western Carpathians. After the Roman emperor Trajan's conquest of Dacia, he brought back to Rome over 165 tons of gold and 330 tons of silver. The largest range is the Tatras in Poland and Slovakia. A major part of the western and northeastern Outer Eastern Carpathians in Poland, Ukraine, and Slovakia is traditionally called the Eastern Beskids. The geological border between the Western and Eastern Carpathians runs approximately along the line (south to north) between the towns of Michalovce, Bardejov, Nowy Sącz and Tarnów. In older systems the border runs more in the east, along the line (north to south) along the rivers San and Osława (Poland), the town of Snina (Slovakia) and river Tur'ia (Ukraine). Biologists, however, shift the border even further to the east. The border between the eastern and southern Carpathians is formed by the Predeal Pass, south of Braşov and the Prahova Valley. In geopolitical terms, Carpathian Mountains are often grouped and labeled according to national or regional borders, but such division has turned out to be relative, since it was, and still is dependent on frequent historical, political and administrative changes of national or regional borders. According to modern geopolitical division, Carpathians can be grouped as: Serbian, Romanian, Ukrainian, Polish, Slovakian, Czech, Austrian, and Hungarian. 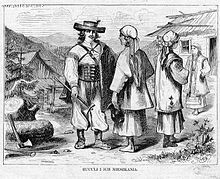 Within each nation, specific classifications of the Carpathians have been developing, often reflecting local traditions, and thus creating terminological diversity, that produces various challenges in the fields of comparative classification and international systematization. Section of the Carpathians within borders of Ukraine is commonly known as the Ukrainian Carpathians. Classification of eastern sections of the Carpathians is particularly complex, since it was influenced by several overlapping traditions. Terms like Wooded Carpathians, Poloniny Mountains or Eastern Beskids are often used in varying scopes by authors belonging to different traditions. Ludwig Greiner — an influential 19th-century lumber industry management expert who identified Gerlachovský Peak as the highest mountain in the Carpathians. ^ Peter Christoph Sürth. "Braunbären (Ursus arctos) in Europa". Archived from the original on 15 August 2008. Retrieved 10 March 2011. ^ Peter Christoph Sürth. "Wolf (Canis lupus) in Europa". Archived from the original on 15 August 2008. Retrieved 10 March 2011. ^ Peter Christoph Sürth. "Eurasischer Luchs (Lynx lynx) in Europa". Archived from the original on 15 August 2008. Retrieved 10 March 2011. ^ "Carpathian montane conifer forests - Encyclopedia of Earth". www.eoearth.org. Archived from the original (MediaWiki) on 4 April 2010. Retrieved 4 August 2010. ^ Europe: New Move to Protect Virgin Forests in Global Issues, 30 May 2011. Retrieved 31 October 2011. ^ a b Paun es Durlic (2011). Sacred Language of the Vlach Bread. Balkankult. Retrieved 15 November 2016. ^ a b c d Moldovanu 2010, p. 18. ^ a b Blazovich 1994, p. 332. ^ Buza 2011, p. 24. ^ E.g. in work Tractatus de duabus Sarmatiis, Asiana et Europiana, et de contentis in eis by Mathias de Miechow, first edition from 1517. Second book, chapter 1. ^ a b "Gervase of Tilbury" . Dictionary of National Biography. London: Smith, Elder & Co. 1885–1900. ^ Gądek, Gradiecz, Bogdan, Mariusz. "Glacial Ice and Permafrost Distribution in the Medena Kotlina (Slovak Tatras): Mapped with Application of GPR and GST Measurements" (PDF). Landform Evolution in Mountain Areas. Studia Geomorphologica Carpatho-Balcanica. Retrieved 3 February 2013. ^ Dolton, G.L., 2006, Pannonian Basin Province, Central Europe (Province 4808)—Petroleum geology, total petroleum systems, and petroleum resource assessment. U.S. Geological Survey Bulletin 2204–B, 47 p.
Blazovich, László (1994). 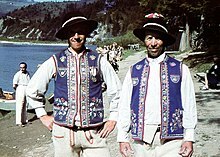 "Kárpátok [Carpathians]". In Kristó, Gyula; Engel, Pál; Makk, Ferenc (eds.). Korai magyar történeti lexikon (9-14. század) [Encyclopedia of the Early Hungarian History (9th-14th centuries)] (in Hungarian). Akadémiai Kiadó. p. 332. ISBN 963-05-6722-9. Buza, Mircea (2011). "On the origins and historical evolution of toponymy on the territory of Romania" (PDF). Revue Roumaine de Géographie / Romanian Journal of Geography. Institute of Geography, Romanian Academy. 55 (1): 23–36. ISSN 1220-5311. Retrieved 27 June 2015. Moldovanu, Dragoș (2010). "Toponimie de origine Romană în Transilvania și în sud-vestul Moldovei" (PDF). Anuar de Lingvistică şi Istorie Literară (in Romanian). Institute of Geography, Romanian Academy. XLIX-L: 17–95. Archived from the original (PDF) on 5 March 2016. Retrieved 27 June 2015. Wikivoyage has a travel guide for Carpathian Mountains. Wikisource has the text of the 1911 Encyclopædia Britannica article Carpathian Mountains. Encyclopedia of Ukraine, vol. 1 — Carpathian Mountains, by Volodymyr Kubijovyč (1984).